When you’re heading out on the highway, it’s always awesome to have some great tunes to accompany you on your trip into the unknown. Many motorcycle riders internalize their favorite music with a nice pair of headphones or a Bluetooth ready motorcycle helmet, but what if you’d like to play your music for more than just yourself? This is where the motorcycle speaker comes in. For the most part, these are devices that will attach to your handlebars and send some awesome acoustics back at you, the driver, but there are also units on the market that will produce some amazing sounds for when you are hanging out with your motorcycle riding buddies. With so many of these types of devices on the market today, it can get a bit confusing when you’re trying to find the best. To make things easier for you, we’ve created this guide which features some of the best devices on the market today as well as some pre-purchase considerations that you should take into account before you make a buying decision. Our Gold Pick product, which is a 1000 watt motorcycle sound system from the car and vehicle audio masters at Boss, is a great, easy to install system that is also perfect for ATVs and off road vehicles. As a Gold Pick, this system packs in all of the features you want and need in a motorcycle audio package and is also largely considered one of the best packages of its type by both consumer and critical groups. Boss Audio systems has been producing systems of this type since 1987, and in this nearly 30 year history, has refined their offerings steadily and innovatively. Firstly, this motorcycle speaker system comes with four speakers. They can each be mounted on your handlebars for a fully immersive sound. To mount, simply unscrew the mounting brackets and place them around your handlebars. After this is complete, tighten so that the speakers will stay in the position that you put them in. After their physical connection is secured, you can connect the amplifier unit wherever you’d like to the body of your motorcycle; you’ll just have to screw it in or place it into a pack. This device has a plethora of great features that will ensure your ride is pleasant and acoustically enjoyable. Firstly, this is a Bluetooth enabled speaker system, with it, you’ll be able to connect any Bluetooth enabled device to it wirelessly, and then be able to play your favorite music apps like Pandora and Spotify. Also, you’ll be able to adjust the volume of the generated sound via a wired remote control system. In addition to this wireless connectivity, the main amplifier box has additional wired connectivity, so that you’ll be able to play your music from legacy devices like CD and mp3 players. These connectors include a standard AUX input that uses a headphone sized connector to produce sound on the right and left channels as well as a left and right RCA input for the speakers themselves, so that you’ll be able to broadcast sounds from AUX devices and produce a stronger stereo output signal. These speakers are weatherproof and have great frequency response of 80Hz to 15KHz, SN 85dB, THD: 0.01%. This will ensure that there will be little additional noise while you are sitting on your vehicle and jamming out to your favorite tunes. In addition to this, the amplifier has a maximum power output of 1000 watts that’ll provide all of the bass response you need for some truly memorable drives. 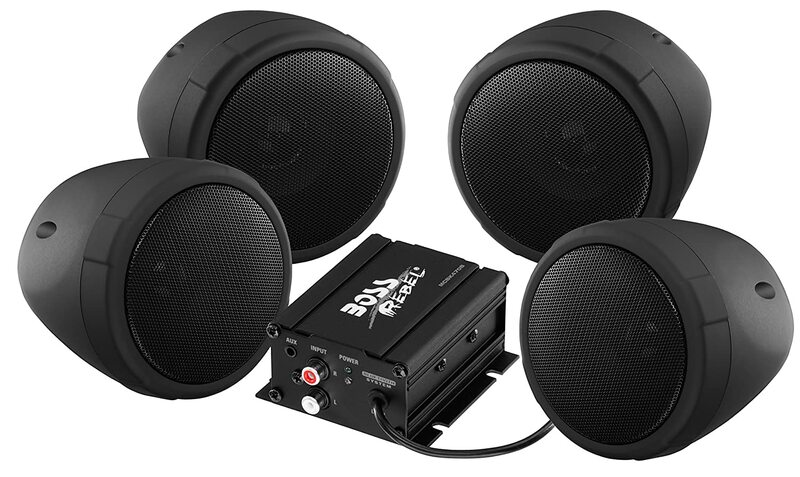 Boss Audio also has covered this sound package with a great three year warranty that’ll ensure that you’re covered for a very generous amount of time. Shark is a company that specializes in motorcycle audio, and it’s this refined expertise that is plainly exhibited in the excellent design of our Silver Pick product. 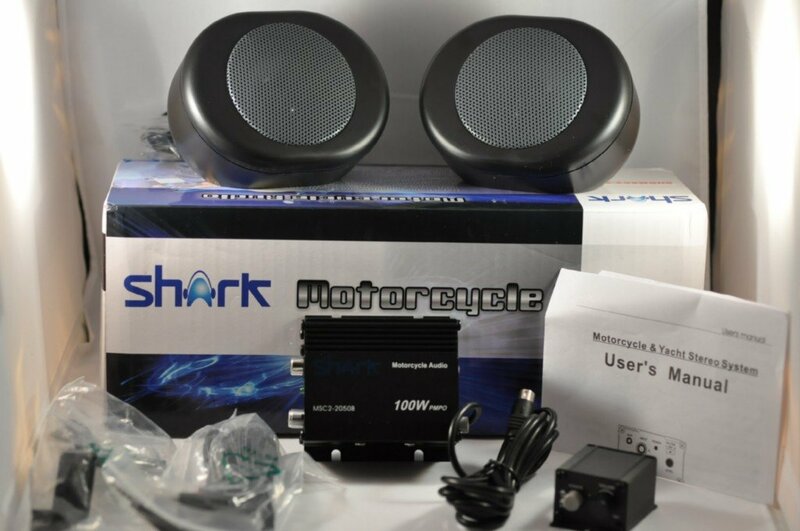 Shark Motorcycle Audio has been in operation for just eight years and yet has become one of the leading producers of motorcycle audio systems. This dual speaker system produces a truly unique sound that is perfect for those trips where you’re experiencing the great outdoors, but would also love to hear a little bluegrass as you drive. These speakers look great. You can get them in either a black coloration or a silver one, either is great looking. 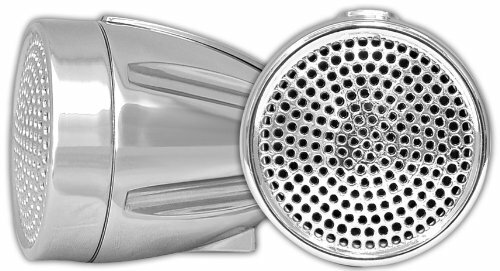 The first thing you’ll notice about both of these styles is how well they’d go with just about any motorcycle design; as a matter of fact, these speakers aren’t just designed for motorcycles, but can be used on watercraft like yachts and sailboats, or on off road vehicles like ATVs and motorized scooters. Similarly to our Gold Pick, to install, you simply loosen the mounting brackets, place them in the appropriate position on your vehicle, and tighten so that they won’t be able to move easily when you’re driving. The amplifier box that comes with these motorcycle speakers can be attached in most places on your bike, or simply placed in a bag or in your vehicle’s pack. There’s more than enough wiring to accommodate most models of motorcycle, and there is a wired remote that can also be attached onto your handlebars that’ll allow you to power on the system or adjust the volume without having to take your eyes off of the road. The remote even features a green light that will let you know if the system is powered on or not. The speakers are waterproof and feature a 100 watt amplifier that produces more than enough high powered sound for the majority of today’s bikers. The amplifier has a RCA connector that handles both the left and right frequencies for your speakers as well as an AUX input which will allow you to connect audio devices such as mp3 or CD players. These speakers also feature channel separation 50dB and a powerful Frequency response of 20Hz-20kHz, so you won’t have to worry about excess noise on your rides. Pyle audio was founded in the 1960s and is one of the better known audio system manufacturers globally. Since their early days, Pyle has crafted audio experiences that have ranged from in-home sound systems to sound systems that are designed for the deeply aural car audio experience. Our Bronze Pick, which was developed by Pyle’s motorcycle engineers, has a lot of great sound and a relatively simple installation that will help bring your favorite tunes to your hog. As a dual speaker system, you might expect less sound quality than the four speaker setup featured in our Gold Pick, but surprisingly, this is a truly high fidelity sound system. The speakers are a bit largish for some motorcycles, but their chrome plated design looks great on a Yamaha or a Harley. Simply mount them through your handlebars via the mounting bracket and they’ll look excellent. The small amplifier unit of these stereo speakers works well just about anywhere on your vehicle, but some users have found that it goes almost perfectly in any front mounted tool roll. All you have to do then is run a wire from the amplifier to your favorite media device and the music will play through the speakers perfectly via the right and left RCA connectors. These are great speakers for a motorcycle phone dock; just be sure that your phone is connected securely. These are weatherproof speakers, not waterproof, so don’t fully immerse them if you can avoid it. There is a wired remote that will also allow you to power on and off the system as well as control the volume; it works well in the center or at the ends of your handlebars. The amplifier for this unit has a 50 watt output that also has a frequency response in the 20Hz-20KHz range. 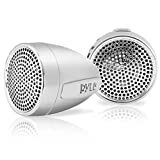 If you’re a baller who is currently on a budget, never fear, there is a great option from Pyle audio that will satisfy your need for great sound without totally laying waste to your bank account. Unlike our previous picks, our ballin’ unit doesn’t include an amplifier, so you will have to make this purchase separately, but if you’re looking to upgrade your speakers, or you have had problems with the speakers you currently have, this is the perfect solution to your issues. Firstly, these speakers are surrounded by a chrome cabinet that even extends to the grill of the unit. The bullet style shaping really goes with steel handlebars that feature chrome devices and chrome rear views. The speakers also feature a finned design that makes them look great on the majority of bikes on the market today. The peak power that these speakers can generate is 600 watts; for a truly powerful aural experience. Installation is accomplished via the chrome mounting brackets; simply loosen, attach, and tighten securely and you’re done. Like the other devices featured in this guide, these speakers are weather resistant and will handle the ambient heat generated by your vehicle with aplomb. The frequency response is 200-20K Hz, so you shouldn’t experience much in the way of excessive frequency noise. As with many new car audio systems, it’s now possible to get remote controlled speaker systems that you can control from your motorcycle’s handlebars. These systems will allow you to control the volume, change a track, or even stop, play, and pause the music that’s currently being played through your speaker system. This level of ease is great; especially when you are using a Bluetooth-compatible system that is pulling music from a mp3 player, Smartphone, or tablet that may be packed away in your pocket or pack. Typically, these are mounted onto your handlebars, though units that are controllable on your dash are available as well. Some motorcycle speakers actually come with the ability to dock your external device. This creates an instant connection with your mp3 player or Smartphone and, in some cases, will allow you to charge the device simultaneously as it plays your tunes. Since this comes with a motorcycle speaker, be sure that your device is thoroughly secured, as you know that the high wind pressures can easily send a small Smartphone flying to its early death. Also, try to find units that support a plethora of connection types; you might be using a lightning compatible iPod now, but what if you buy an Android USB type C device in the future? You don’t want to have to replace your entire speaker system because you have a new device, so look for one that has a lot of versatility. These types of devices come in a myriad of designs and this goes the same for your motorcycle, so it won’t really do for your speakers to not match the design of your motorcycle. 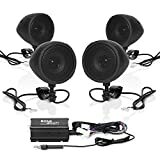 When searching for a new set of motorcycle speakers, be sure that they match the general aesthetic of your vehicle; especially since these are external devices that everyone will see. Fortunately, many speakers can be housed in chrome housings, so that they’ll match the exterior of many types of hogs on the road today. Every audiophile knows that good sound quality consists of a speaker’s ability to handle the high range, the mid range, and the low range of sound. When it comes to motorcycle speakers, this is somewhat complicated by the fact that there is no internal harmonic chamber for you to experience a full sound like when you’re in a car or truck. Some motorcycle speaker manufacturers counter this limitation by creating speakers that are designed to work behind the windscreen of motorcycles that have this feature. When a windscreen is used, the interference that occurs when wind hits a driver is greatly reduced, and you end up with a much cleaner, noise-free sound that emanates from your motorcycle speakers. Everyone wants deep thrumming bass from their speakers and with a high amount of bass response you’ll have plenty of oomph in your speakers. Bass response varies from device to device, so it’s a good idea to research this when you’re looking for a new set of motorcycle speakers. Even though it’s great to have an excellent midrange or even a resonant high range, the bass response is where you’ll hear the majority of the intended audio dynamics of your music, and while you may lose a lot of the other audio features while you’re on the highway, you’ll always be able to hear all of the good, bassy sounds if your speakers have good bass response. In a world of increasing portability, it’s nice to have a set of motorcycle speakers that can interface with your most portable electronic devices. Bluetooth is a technology that will let you connect one device to another wirelessly, so having this kind of functionality while you are riding your motorcycle can be really useful, as it will allow you to experience a fairly no fuss music control. Also, with this kind of output, you can start up programs like Spotify and Pandora and output them through your Bluetooth-enabled sound system. Another positive feature of this is that many of these systems will automatically connect to paired devices, so when you start up your bike, your speakers will start playing music from your phone or tablet immediately. Hitting the road and experiencing all of its adventures is an experience that’s amplified by having a good pair of motorcycle speakers to provide you with some great tunes. The devices featured in this list are excellent choices for any biker who wants to hear their music while on the road, but remember these aren’t the only choices on the market. If you don’t like the devices that we’ve posted here in this guide, remember to use our pre-purchase guide so as you continue your search, you’ll have a good source of information to find a quality device that’ll meet all of your sound needs.